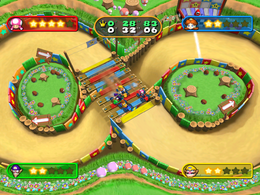 Kart Wheeled is a 4-player minigame in Mario Party 7. Its name is a pun on "cartwheel". This minigame is similar to Slot Car Derby from Mario Party and Mario Party 2, except with real vehicles rather than toy vehicles. The four players drive up to the starting point in their karts, one at a time. Players must avoid the walls and each other as they drive around a figure-8 track. Each player attempts to perform five laps first, and the one who does this wins. This is one of the minigames that can appear in Decathlon Castle. Here, the player's objective is to complete five laps as fast as possible to earn as much points as possible, up to a maximum of 1,000. The winner is standing on a podium, with the losers standing in front of it. The winner then performs their victory animation and the losers perform their losing animations as five Goombas and a Shy Guy cheer for the winner nearby. Rules – "Get behind the wheel and race around the figure-eight track. The first player to complete 5 laps is the winner!" Advice – "Steer clear of walls and rival buggies. Bumping into either one will slow you down." This page was last edited on March 27, 2019, at 01:16.